The Maldives. According to your holidaying bent, either an idyllic, sand-framed pearl necklace that’s almost literally exhausted the world’s travel writers of superlatives, or a mainstream snooze-fest where bourgeois newlyweds deservedly have their ceremonies sabotaged by exploited local hotel workers. Me? I was keeping an open mind. I had a wont, though, to try a third way. My challenge? To find something challenging. After the hot and cold running luxuries on offer and all the free canapés I could snort, I wanted to test my primal urges on a less comfortable stage, and if that meant confronting the food chain head on, then so be it. 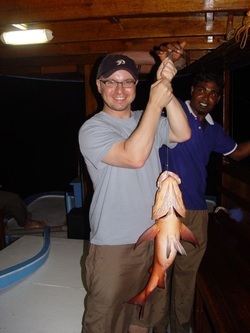 And so it was, reader, that I joined the soul-wrenching, visceral trial of the Veligandu Island Resort 'Cook What You Catch' night-fishing trip. For the winners: feast; for the losers: famine, or at least the shame of having to rely on the hotel’s all-you-can-eat dinner buffet, like the failed hunter-gatherer you so obviously are. 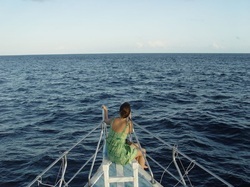 Calm weather and fair winds favoured us that evening, my friends, and as dusk approached, our trusty vessel left port. Our crew was a gnarly, grizzled bunch, schooled by the cruelties of a life negotiating the business end of the unforgiving ocean, as well as several years fixing fruit cocktails during shifts at the CocoCabana Beach Bar. We’d been at sea an hour or so, and even then, at the halfway point of our arduous journey, our supplies were running low. Drinking water had all but been consumed, and I was forced to find sustenance in a lightly-chilled bottle of Corona Mexican beer. Times were harsh: it was not quite at the perfect serving temperature. A further body blow hit as it transpired we had quit land without any sliced limes. I feared scurvy, and beer without a hint of citrus, but not in that order. 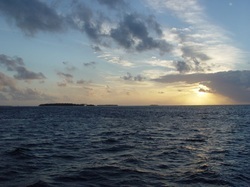 The shadows were lengthening ever further as our wise old skipper, perhaps in his early 40s, cut the engine. Silence fell and somewhere in the distance, an 80s karaoke night started up. The crew scurried around, the air thick with impenetrable, exotic sea slang, the deck a sudden blur of activity as lines, weights, hooks and bait were fixed up and presented to us. My brow furrowed. What would the hunt bring? Which species of fish might prove to be my piscine nemesis? What the hell were we actually supposed to do with this weirdly primitive equipment, aren’t they going to give us bloody rods or something? There was a sense of foreboding - a mixture of the encroaching darkness, the inevitable battles ahead and the thought that I had no idea what to do if anything actually happened. Tranquility eventually prevailed, the boat swaying and creaking in the night’s solemn breeze. I fixed my stare on the surface of the water, my fingers finely attuned to any slight movement on the line, my mind focused on the unknowable machinations taking place below the surface and what maritime stratagems might need to be employed in the name of survival. I was also concerned about whether the remaining beer might have cooled to a more satisfactory temperature. 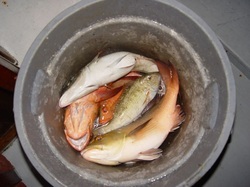 Across the bough of the ship, my fellow anglers were already enjoying some success. A couple of writhing barracuda had been reeled in, and were dying the honourable death of the hunted in a dance that has been repeated since the dawn of time: flapping around in a dirty old bucket. I couldn't allow myself to be distracted, though. I had to focus on the beast I knew to be lurking in those brackish depths. There was a barely perceptible stirring, one to which only true fisherman could be receptive - luckily, one of them came over and pointed it out to me. From that moment, sheer primal instinct kicked in. I had my enemy on the hook. It was now a raw pitch battle - the fish fighting for its life, and me with only my cunning, my bare hands and my three or four crew members to help me with the actual reeling in. Both sides fought for advantage, each facing fatigue from the endless thrashing of the waves and, in my case, the need to reach for a bottle opener. Finally, though, the head of the behemoth could be seen rising from the spew of the tropical brine. The battle won, I stepped back and let the crew take over the formality of wrestling the great beast onto the deck. To the casual observer it may have looked like I was balking squeamishly at having to witness the end of this noble creature, a mere tenth of my size, but in the manner of all seasoned seamen, I was simply moving away to allow the fish some final dignity. 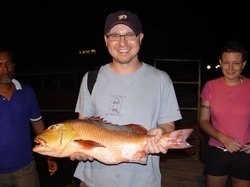 As the giant Red Snapper lay on the deck and gave up its life, the prize was handed to me, and I held the line aloft at arm's length, a mixture of dutiful respect and not wanting to get dead fish goo on my t-shirt. All was well with the world: the group would eat tonight and sleep contentedly with full bellies and, better yet, we would make it back to shore in time for half price cocktails at the CocoCabana.